This page was retrieved from https://www.fcd-us.org/shared-vision-transforming-workforce/. In April 2015, the Institute of Medicine and the National Research Council released the report Transforming the Workforce for the Children Birth Through Age Eight: A Unifying Foundation (IOM/NRC Report). We view this report as the blueprint for the Foundation for Child Development’s work to support the preparation, competency, well-being, and on-going professional learning of the ECE workforce. Advancing the development of a competent and diverse workforce is essential to enhancing the quality of early learning experiences for young children and improving the chances of children reaching their full potential. Effective interaction with diverse groups of young children is, in itself, a complex task. Further, it is clear that the science of childhood development has important implications for the early care and education workforce. 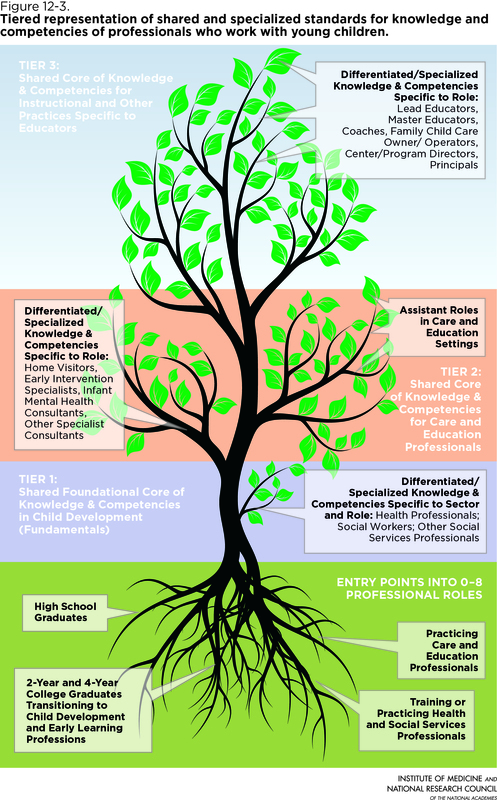 It follows then that a unified set of professional competencies must include knowledge of how professionals should work with children to meet their needs. Across professional roles, shared and specialized knowledge should reflect standards of effective, consistent instructional and support practices which result in children learning, growing, and thriving in high-quality learning environments. The report offers a foundational framework for the specific knowledge and competencies needed so that all early educators and leaders know how to foster children’s learning across the birth through age eight continuum. The Foundation also holds the IOM/NRC Report’s assertion that such knowledge and competences do not exist in isolation and many interacting elements are necessary to support quality professional practice (See Figure 12-3). A coordinated approach allows for continuity of care and practice across ages, settings, and programs which promotes children’s learning and development. Creating enriching learning environments for children also requires creating supportive working environments and integrated service systems. Stronger, aligned policies across local, state, and national systems, and cohesion across preparation and professional development systems, are infrastructure elements required to support early care and education professionals in their work. The report has 13 recommendations to guide the systems change needed to help improve the current knowledge base and practice of the ECE workforce, as well as improve infrastructure and support systems. Our grantmaking is aimed towards implementing many of those recommendations to create the systems that work. We all have a role to play in the blue print for action to make the systems change needed a reality. Enhance the quality of professional practice through implementation research.